Finding the negatives lying around on the floor, picking them up, weighing them, and then moving on to the next one. On Friday I went out and pushed myself farther, physically, than I have since the first surgery last May. I immersed myself in the beauty of nature, submersing myself in the cleansing pain of vistas gained one foot in front of the other and the jarring descent to the reality of the road we came in on. I slept the sleep of the gods, whatever that is, on Friday night. That pure, economical sleep of a body repairing itself with me getting out of my own way with a couple glasses of wine. Then blissful nothingness. 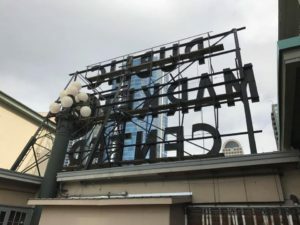 I got up at 5:30 on Saturday morning and drove my wife and daughter to Seattle for another change of perspective, one I hoped would bring me a step closer to the evenness that can eventually come in the days or weeks after substantial trauma. The friends of mine who have already moved on, graciously accpepting what they cannot change, grinning, bearing it and moving forward, have earned my jealousy and admiration. Those who have already engaged the system by volunteering, reaching out, giving or otherwise taking steps to mitigate the coming damage of a hateful, racist and bigoted regime, have my eternal gratitude. My daughter loves big cities. After her formative years in the rural and downright expansiveness of Montana and Alaska, Chicago’s cramped cultural proclivety captured her attention in its endless possibilities. While I love both the seeming endlessness of the Great Northlands and urban intellectualism, I wanted to impress upon her the beauty of ideas, the refreshment of diversity and the taste of cultural soup in the aftermath of such a white and divisive campaign season. She was two when she met Obama in a receiving line at the University of Montana and has known his presidency for most of her decade of life. She smiled at me, in that way little girls do when they don’t want to dissapoint dad, having moved on from an interest in a pink White House to her current desire to be a fashion designer/dolphin trainer. In Seattle we talked about art, we tasted ethnic treats, discussed homelessness and poverty. She wondered about the Art Institute and living in a big city by herself. Thoughts far beyond the four years of terror (if that) we currently face. “You’ll have an apartment with a good stove, and your mom and I will come up to visit. We’ll go to Pikes and buy fresh produce, and I’ll cook for you,” I told her. She smiled that wide, satisfied smile when new vistas are opened up. This from the little girl who just a few years ago said she wanted to live next door to her mother and I for the rest of our lives. In a tea shop in Pikes Market, we met a young man who asked if we had ever been there before. We said yes, and he asked if he was here the last time we came to taste the fine Dragonwell and Blue People teas. When we explained that she was just a year old or so when we last visited, he realized he was only 11 at the time and not yet working with his mother selling tea to tourists and residents of downtown Seattle. He kept saying we were blowing his mind, that he was looking at half his life sitting at the tasting bar. Time passes. Wars begin. Wars end. We look back at the past from a different perspective than the one we looked tentatively at the future with. I had many perspectives from which to view the events of the days I spent in Chicago. My black friends and the Latinos and Latinas on my daily commute. Their life stories opened to me each morning and evening. My gay friends learning to build community in places where none existed. My Palestinian neighbors integrating into someone else’s world. These are experiences I lack in the white, rural west. But I’m not going to harden my heart to the things I cannot see and understand each day. My quest for whatever these four years bring will be to continue to challenge myself to see the marginalized, the desperate, those who are beaten down. I no longer wish to watch the time go by lamenting the system and the practitioners of hate and injustice. I will seek out perspectives I’m not comfortable with, perspectives I need to see in order to make a difference in myself and my children. Sometimes changing your perspective is as simple as changing your mind, creating an open space for new thoughts. Mosty, for me, it’s driving to a new place and seeing things I don’t see, experiencing things I don’t see, tasting foods I’ve never tried. Reading books I’ve never heard of. It’s looking into the eyes of poverty, pain and hunger. It’s seeing our own vulnerabilities in the peopel who walk past us each and every day.